Raising children is tough, and the number of parenting books available today doesn’t make it any easier. Parenting books about positive discipline techniques for toddlers, children, and teens are no exception. This collection of the best positive discipline books for parents, teachers, and caregivers can be used both in the home and in the classroom to discipline children of all ages! Before I had my daughter, I spent over 20 years working as a nanny, teacher, and coach. I can recall spending hours of my personal time pouring over positive discipline books for parents and educators to help me take charge of the children in my care. Once I became a parent, I added a few new gems to our bookshelf. 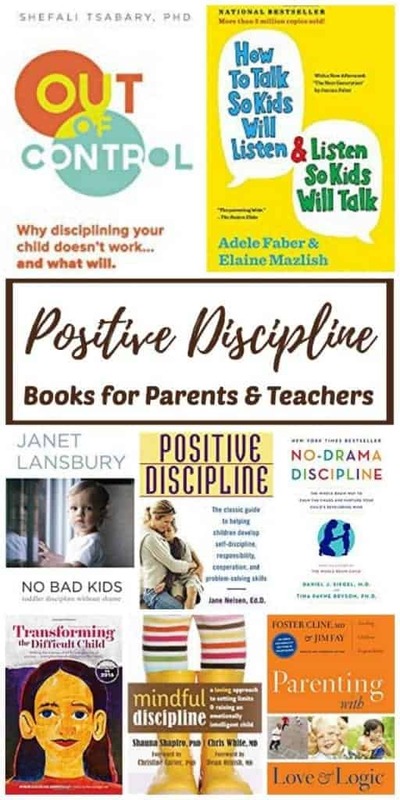 Even though I don’t agree with every word written in each of these positive discipline parenting books, these were the best books I found about disciplining children for parents and caregivers. Our suggestion is to read the books that look the most interesting to you, and that works the best for the age of the children that you will be working with. You may fall in love with one style and commit to it, or you may pick and choose several techniques that work to form your own style as my husband and I have done. All that matters is that you do what works for you and the children in your care. I always recommend you look for these at your local library or used bookstore first. If you have difficulty finding any of them I have provided Amazon affiliate links for your convenience. If you click to purchase, I may earn a very small commission at no extra cost to you. **Click on either the title or the image of each parenting book to learn more about it. A must-read for any caregiver or parent of a young child. This book provides a practical, indispensable tool for parents who are anticipating or experiencing those critical years when toddlers are developmentally obliged to test the limits of our patience and love. It is presented in a way that shows the utmost respect for our children as a whole and complete individual. We can trust our children and the author explains why and how. This book is written by the experts that wrote one of my favorite parenting books — The Whole-Brain Child . It provides an effective and compassionate road map for dealing with tantrums, tensions, and tears without causing a scene. Instead, this book encourages parents and caregivers to intentionally engage in the situation in order to use these moments to teach our children what they need to learn to promote better behavior next time. I resonated with the idea of getting off parenting “auto-pilot” by not unconsciously reacting to situations. Positive Discipline Parenting Books by Jane Nelsen Ed.D. Jane Nelsen, Ed.D. wrote a whole collection of excellent books on Positive Discipline for parents and caregivers. In them, she encourages parents and teachers to focus on respect, letting kids have control over some of their decisions, and allowing children to experience the consequences of their actions, both good and bad, in order to reduce conflict the home. Transforming the Difficult Child places the focus on reinforcing positive behaviors and playing down the negative behaviors. Nurtured Heart is the recommended discipline approach of Waldorf educators. As such, it places a refreshing spin on both parenting and teaching, and reveals new techniques and strategies that create positive behaviors. The Nurtured Heart Approach shares a gentle and supportive plan of action that will change your children for the better, even if they are not difficult. Use the Transforming the Difficult Child Workbook by Lisa Bravo, Howard Glasser, and Joann Bowdidge to help use this positive discipline technique in the home or classroom. It presents Nurtured Heart techniques in an easy to read format that can help you better understand this approach to discipline. Parents today are bombarded with endless information that creates an atmosphere of anxiety and self-doubt in our children. This parenting book provides a lesson in mindfulness different from the rest. Mindful discipline redefines discipline and outlines the five essential elements necessary for children to thrive: unconditional love, space for children to be themselves, mentorship, healthy boundaries, and mistakes that create learning and growth opportunities. Out of Control clearly lays out why we enter into dysfunctional patterns with our children and how to prevent them. The author claims that discipline and punishments don’t work. Why? Because the behavior we think we are correcting is not usually the core problem, so we often end up making matters worse. In this parenting book, Dr. Tsabary explains exactly how this works as she guides caregivers towards getting what we really want for our children — a strong foundational center from which their own inspired actions can naturally arise. I read this book for the first time as a class assignment in college. Reading it gave me the skills to communicate more effectively with absolutely everyone in my life. The authors do a great job teaching how to treat children like capable and worthy people, as opposed to irresponsible, unimportant, or unlikable. They first convince the reader to stop criticizing children for how they think or feel and instead focus upon acknowledging how children might be feeling. The second point they emphasize is to make correcting behavior about the behavior, instead of about the child. A must read for all parents, teachers, and caregivers! Love and Logic can help parents and teachers learn to think for themselves and problem-solve from a very young age. Parents can learn to embrace mistakes as wonderful learning opportunities to raise respectful, responsible, and caring children. This positive discipline book helped me to form an integral piece of my parenting strategy, but I did not agree with everything written. I loved the concepts of natural consequences, enforceable choices, and encouraging children to think through their problems. My husband and I both found some of the examples encouraging, while others seemed a bit harsh and overdone. I used one primary concept from this approach to form my discipline style and ditched the rest of the information. According to the author, the 1-2-3 Magic technique offers a foolproof method of disciplining children ages two through 12 without arguing, yelling, or spanking. In it, parents and teachers can learn to manage troublesome behavior, encourage good behavior, and strengthen the parent-child relationship using counting and time-outs. Although our family does not use the “time-out” method, I really appreciated the information offered in this book. I love how easy it is to get my daughter to do something I ask of her by simply counting. When she doesn’t do as I ask, I simply count to 3, and before you know it she does what I asked her to do! Most of the time anyway. Whenever my daughter does not do as I asked by the time I reach the count of three, I then use the REI approach and say something like, “It looks like you need some help.” That usually gets her going. If that doesn’t work, I help her until she begins to do it on her own. Now that’s magic! Another way we have used to discipline our child is to begin at the root of the problem. To do this, we read books that help children understand feelings and emotions, books that help children manage anger, encourage our child to practice yoga, play with calm down sensory bottles, and give our child the opportunity for lots of outside playtimes to help keep the peace in our home. Click on the blue hyperlinked text to learn more about how we use each self-regulation strategy in our home. I hope you and your family find these positive discipline books and parenting strategies as helpful as we have — Enjoy!